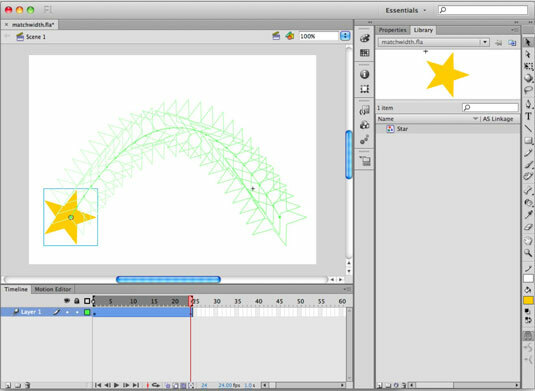 When creating animation in Adobe Flash CS6, you can enable onion skinning to view several frames at a time. With tweened animation, onion skinning can reveal all frames created between the starting and ending keyframes to help you make adjustments and see them in action. You can choose between two types of onion skinning, depending on whether you want to view frames as outlines or full-color previews. Before you get started, create a new motion tween or open a document with an existing tween that you can use for this example. Select the Onion Skin icon underneath the Timeline. A set of brackets appears above the Timeline. Adjust the brackets so that all frames in your tween are selected. You see a full preview of all frames generated by your tween. You can’t select the frames shown in between, but you can move the instances on the starting and ending keyframe. Select the symbol instance on the starting keyframe of your tween and move it. The onion skin reveals how the frames in between change when you shift starting or ending instances. As an alternative to seeing frames in your tween in full color, you can preview them as outlines by using the Onion Skin Outlines option. This option works exactly like the Onion Skin option but shows selected frames using a wire-frame-style outline view. The Onion Skin Outlines option can be a better choice if the full-color preview looks cluttered.